The word hero, and the character traits that go along with it, get tossed around far too easily when it comes to athletes. They play a game, provide entertainment. Sometimes who they are is as impressive as what they do, sometimes not. For J.J. Watt, however, there’s no more apt description this week. In less than four days, the three-time NFL Defensive Player of the Year has raised more than $12 million and counting for hurricane-ravaged Houston. It’s not just the money, though. He’s dug in on every detail of what’s being done with it, from where to get trucks to what supplies to buy to where distribution centers will be, to ensure that all of this money benefits the people who need it. Plenty of athletes and celebrities lend their names and star power to causes, and they’re to be commended. When disasters like Hurricane Harvey hit, anything – everything – helps. University of Houston basketball coach Kelvin Sampson started a clothing drive. Masters champion Sergio Garcia has pledged $2,000 for every birdie and $5,000 for every eagle he makes during the FedEx Cup. Nationals pitcher Max Scherzer is covering adoptions fees through Sunday at Washington D.C.’s Humane Rescue Alliance Centers, which need to make room for animals that will be arriving from Texas. And on it goes. But Watt has taken it a step further. As one of the NFL’s most popular players – his jersey was among the top-10 sellers in 2015, the last time he played a full regular season – his call for donations alone would have been enough to attract a pile of cash. More than 113,000 people have given so far, donating everything from $5 and $10 up to the six- and seven-figure contributions by Drake, Walmart and Tennessee Titans owner Amy Adams Strunk. Watt kicked off the campaign with a $100,000 donation of his own, half of his original goal. Once the money started coming in, Watt could have delegated the details to someone else. He does have a season to prepare for, after all. The Texans have people. Heck, Watt’s a big enough star that he’s got people. So in between practices and meetings this week, Watt has been working the phone. Semi-trailers are heading to Houston from Watt’s hometown of Pewaukee, Wis., and Utah, Watt told the Wall Street Journal. (The storm made it tough to find trucks closer to Houston.) They’re carrying water, food, clothing, cleaning supplies, generators – whatever Watt could think of that storm victims might need. “That’s phase one. That’s going to be the first phase of our operation to get as immediate of an impact as we can,” Watt said in an Instagram video Thursday morning after the fundraising drive had surpassed $10 million. The first loads of supplies will be distributed Sunday by Watt and his Texans teammates. He’ll figure out what to do next after that. 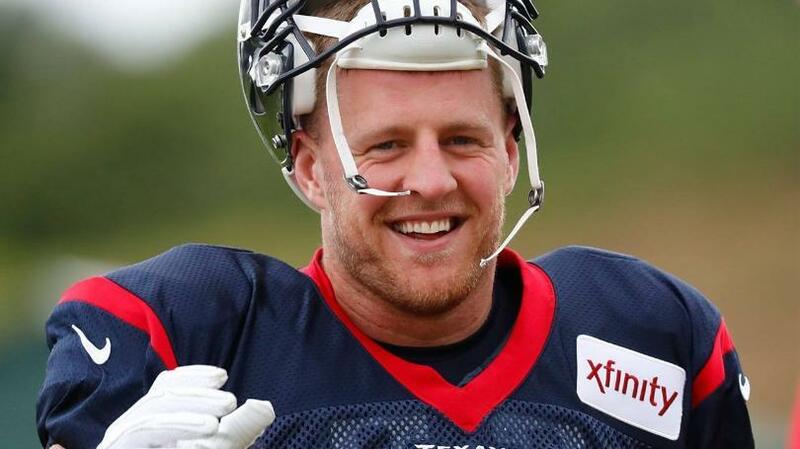 The campaign makes Watt a shoo-in for the NFL’s Walter Payton Man of the Year award before the season’s even begun. But he’s quick to brush off praise. “It’s not me. I’m just the one organizing it,” he said, crediting firefighters and police officers as well as the thousands of others who’ve pitched in to lend a hand to Houston. Whatever Watt does for the Texans this season, it won’t be nearly as important as what he’s done for Houston.